corner of biblioteksgatan and humlegårdsgatan, stockholm, sweden. inner city hotel (“hotell anglais”) designed by architect leif damgaard in 1967. the floor plan reveals the reason for those otherworldly, mysterious balconies without windows (they are part of a system of fire escapes for the hotel rooms in the rear, which fire fighters would not be able to reach from the ladder of a fire truck in the street). 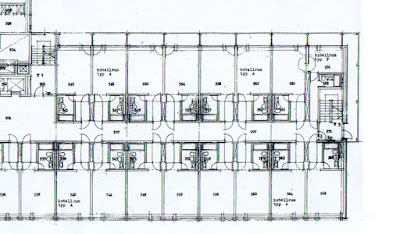 floor plan from the public archives of the stockholm planning department. click on image for larger size floor plan.